There’s something about November that always make me a little crazy, and I’m not talking about leaf blowers. It’s all that Christmas cheer! If you walked into a mall today or turned on your TV, I’m sure you noticed that all of the ghosts and goblins have already been replaced with happy elves and bobbles. In fact, even before the pumpkins started rotting and the costumes went back to the thrift shops, the jingling had already begun. With my Scroogy wait-’til-December attitude you can imagine how irritated I was to find a Christmas library book in my daughter’s school bag on Halloween Eve. “Why didn’t you pick a Halloween book?” I asked, as she placed the Night Tree on my lap. She shrugged and looked at me as if it was no big deal. It wasn’t until after reading the charming tale that I forced myself to apologize. Eve Bunting’s Night Tree offers an eco-friendly alternative to the classic Christmas tree tradition that most of us enjoy each year. Just when you think the family in the book is going to chop their tree down and tie it to their vehicle, they settle in for an evening of singing and fun, decorating “their” tree (which stays in the forest) with sunflower seeds, honey, and apples and leaving breadcrumbs underneath for creatures great and small. While my own daughter chose a Christmas book for Halloween, Nina from the Night Tree book chooses ‘Old MacDonald Had a Farm’ as a Christmas carol. And guess what? Her mom says it’s fine. Two lessons learned. We will likely buy, decorate, and surround “our” tree with gifts this year as we have done every year. However, reading the Night Tree in the pre-Christmas season was a gentle reminder to me that some of my own family’s traditions are ready to be broken or at least greenified. But first, let’s honour November for what it is. November. 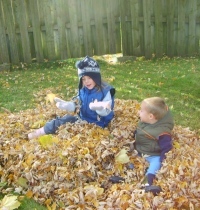 Now go clean up some leaves with an old-fashioned rake and let your children jump in the piles and mess it up. Don’t forget to stretch first!